Fast, easy and even more convenient! The KINGSHARK2 PLUS is built with all of the Aqua King LP's quality features...plus the added benefit of a wireless remote control unit and control box with timer. You enjoy the flexibility of quick spot cleaning before a big event...as well as using the timer for cleaning while the pool is closed. 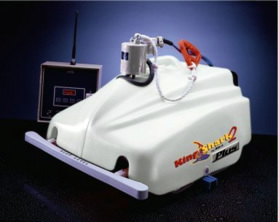 The KINGSHARK2 PLUS fully automatic and will completely clean an Olympic size pool in five hours. It's equipped with a new AV Twister cord swivel to avoid cord tangling and comes with a caddy cart for easy transporting and storage. The KINGSHARK2 PLUS is Aqua Vac flexibility and performance at its best. Designed to save you time, work and money! The KINGSHARK2 PLUS is also equipped with Auto Turn™, a feature that ensures the unit turns at preset intervals making sure your KINGSHARK2 PLUS is always moving and cleaning at maximum efficiency even when it's unattended! Caddy Cart included and hoist is an optional accessory. Filter Micron Porosity/Area 20/40 sq. ft.
©2003-2006 Water & Ice North America Inc.